Effort is for chumps. Ranking things is great. Opinions are likely wrong. Again, here is a brief explanation of the tier system. I have been a really good player this year, and for Wave 4 I really want a way to put Boosted Comms on ships that don't have an offensive retrofit. And the ones that do, I would rather activate more squadrons with an expanded hanger anyway. Also, I want to be able to activate the squadrons late, after I shoot. And I want the whole thing to be cheaper than Boosted Comms, because I have been really, really good and didn't write any posts about Rhymer being a crutch. P.S. When you make this card that bends the game over your knee and breaks it, especially in conjunction with another card that we will discuss later, can you also make it non-faction specific and also non-unique? And usable on literally every ship? Thanks again, and remember I didn't complain about how long Wave 3 and Wave 4 are taking to get here. Raymus Antilles (Rebel) - Just about every single ship out there would love to have Raymus onboard. He adds a squadron activation to carriers, he helps big ships repair, he lets fast ships stop on a dime, or sprint out of danger, and he turns Salvation's cannon into an even bigger monster. A good card that is only brought down by you only being able to have one. Lando Calrissian (Rebel) - Four points to be able to laugh at a Demolisher? Sold! Good on anything you would rather not have die, it's only drawback is you only get to use Lando once - both in the sense that you can't put him on multiple ships, and that he is discarded when you pull his reroll tricks. Skilled First Officer - Arguably the best dial manipulation tool in your toolbox. Sure he doesn't work on Command 1 ships, but he doesn't need to! Command 2 ships, he is like a Support Officer, only better and 1/4 the cost! Command 3 ships he's still pretty darn good, plus he protects against Slicer Tools. He's just really, really good, and it is hard to argue not taking him on any Command 2+ ships, unless you need that extra "NOT TODAY!" that Intel Officer provides. 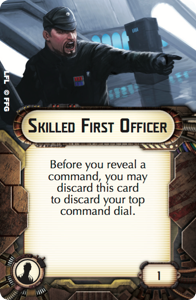 Intel Officer - Definitely a beast on heavy damage ships, he is almost an auto-include onto any list, and hard to justify not taking on anything expecting to drop 8+ dice on something. More or less, this is the upgrade that all other upgrades will be compared against for big ships - "Is it worth giving up Intel Officer to do [X]". Admiral Needa (Imperials) - For two points, a steal of a defensive upgrade. An ISD really wants that evade, and hell, a VSD or Interdictor kind of want it too. Can be used to give the Empire a Turbolaser Reroute Circuit ship, even if it is a 82 point monstrosity of a VSD1. Solid, and worth looking at. Agent Kallus (Imperial) - Do you hate elite squadrons? Do you want to kill them extra badly? Kallus is your man! Blues for Scatter squadrons, Blacks (or Reds!) for Brace squadrons. Put him on a dedicated anti-fighter platform and go hog wild swatting Jan Ors out of the sky. Excellent with other cards, and cheap enough to include that you don't feel like you are wasting him. Admiral Titus (Imperial) - Slow down or speed up any one ship at the very start of turn one. Excellent card for turning a small mistake into a critical one. Very inexpensive at 2 points. He is a very solid choice to tag along in an Imperial fleet. Combines very well with tractor beams, Special K, or Interdictor shenanigans. Chart Officer - Make any TRC-90 into Jaina's Light, not just the first one! Cheap and effective, and gives you more options, which always puts things high on my list. Solid A.
Wulff Yularen (Imperial) - Keeping a token is an interesting mechanic, and a useful one for being able to do a variety of things. For example, improving your engineering value on an Interdictor, or flinging a 6th squadron on an Expanded Hangers ISD. Or just always navigating on a Demolisher with Engine Techs. Wulff is good alone, but better with combos. A solid choice. Adar Tallon (Rebel) - An expensive way to double up on a specific squadron. I ironically think he works best with Rogue squadrons, such as Dash Rendar or Han Solo - activate them with your ship, have them do their thing, and then have them do it again in the squadron phase, moving too! Han in particular can be used this way to triple tap something without Yavaris on the board. But it is an expensive combination, to be sure, and he is 10 points for one squadron to use this way. Good, breaking key mechanics, but not spectacular. Leia Organa (Rebel) - Newly happy on board a GR-75, Leia can function as Slicer Tools protection or just emergency dial changer. A good way to always have squadron commands cued up for your big ships, then not have then when you really don't want them anymore. Problem - her key mechanic can be replicated by not screwing up your command dials on previous turns. Good but a luxury. Veteran Captain - Free token for 3 points, right when you need it. Solid. Combos well with Garm, does okay with anything that doesn't hand off tokens. Solid, but not spectacular. Admiral Montiferrat (Imperial) - Another solid choice of the Empire. Admiral Monty makes something harder to kill so long as it is fast. It can work on anything but the Victory or Interdictor, and is a good defensive upgrade for your flagship, or a Gladiator you have crashing in. Toryn Farr (Rebel) - One Blue dice rerolled, and a lot of points into taking her. It isn't that her ability is bad, it is that you almost have to build around it once you commit to her on your team. And where do you put her? 7 points is a hard sell on a 3 hull Transport that needs to stay in the thick of the action, but she doesn't work on her own ship. A decent card that can be deadly in the right hands, but takes some thought and effort to put to use. Admiral Chirneau (Imperial) - A decent card with some steep cost and fairly high drawback. Admiral Chirpy lets you do some things that even Intel can't do, like move squadrons that are engaged with Instigator, but only at speed 2. Again, the cost of Chirneau (10 points) relative to the cost of Intel squadrons (12 for a generic) make it hard to justify him in a list. Not awful, but not great either. Defense Liaison - Being able to change your dial to either an Engineering or a Navigation is a nice perk, and relatively inexpensive if you ignore the cost of a command token. Almost certainly the better of the two Liaisons, but that doesn't make it good. Support Officer - Mediocre in terms of cost, and what ships it can work on (Command 2 has better options, and Command 1 is pointless, leaving only Command 3 ships). Discarding all command dials and then being able to set them at the start of a turn is a nice trick, and good for quickly shifting strategy... but you can do that by just picking the right commands in the first place. Also, other things can do similar tricks. Wing Commander - It's a lot of points to spend to make sure you can make a squadron command, sure. But if you are going to be doing nothing but squadron commands until you can't anymore, this isn't a terrible option. Set your favorite non-squadron command (Engineering / Navigation) and feel confident that as soon as your squadrons are no longer useful to your big ship, you have something else keyed up. It's not great, but it isn't bad either. Commandant Aresko (Imperial) - All the great things about Wulff and Raymus, but less awesome in almost every single way. At least the point cost is the same. Director Isard (Imperial) - I have seen some thoughts that Isard and Slicer Tools work hand in hand. Sure, that's 10 points that work well together. But aside from that, Isard is 3 points that isn't giving you much. If you have been playing awhile, you should be able to guess your opponent's command stack pretty accurately. Personally she is borderline "F". I want to like her, but there are many better ways to spend your points. Engineering Captain - A lot of points to spend for "Oh god, I really wish I had an Engineering Command dialed up right now" but with Slicer Tools out and about, this is decent insurance. 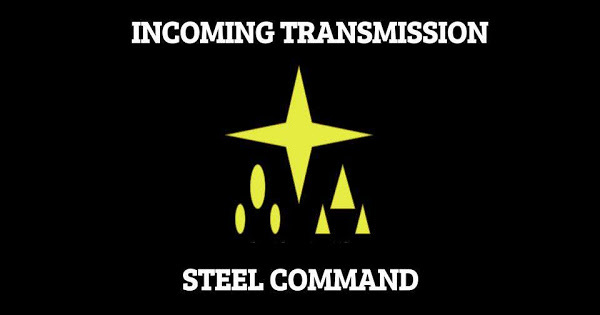 Sometimes you just need that engineering command to stay alive. Weapons Liaison - Spend a token to change to a squadron or a concentrate fire? That is hardly a set of commands you should be freaking out about not dialing in, specifically one you should be spending a token so switch out. Wave 2 and 3 give us better ways to do this, without the drawback. Navigation Officer - A lot of points to spend for "I really wish I had a Navigation dialed up right now." Sometimes you really need that command dialed up to stay alive... but you shouldn't have pointed your VSD right at the opposing edge then, now should you? Tactical Expert - A lot of points to spend for "I really wish I had a Concentrate Fire dialed up right now." Like Weapons Liaison but worse in that you can't even dial in a squadron command. Anything that would want this either is Command 1, and doesn't need it or wants some other officer a LOT more. Unless a Concentrate Fire trigger card is released, this may be the worst card possible. Do You really think so highly about Chart Officer regardless taht it is discarted after use? Well, I am not indending to park on rocks more than once per game with my flankers. How on the hearth does Han get triple taped without Yavaris? I'd like to understand how this is mean to work. 1: Activate Han w/ Tallon ship in ship phase. Toggle slider. 2: Activate Han w/ Rogue in Squadron phase. 3: Activate Han first during next round with Han ability. Almost a reverse Demolisher there. Two attacks near the end of one round and one attack at the top of the next. I though you mean in one turn he get to be activated 3 time. Interesting though I'm not sure worth all the investment. I feel that the Liaison officers do have a place in a Grand Moff Tarken fleet. VSD carriers can have Weapons Liaison to either move squadrons downfield or throw 4 red dice. Gladiators (and their ilk) can always have a ready maneuver or repair with the Defense Liaison.